A new president is in office and he’s promising a new era for America. But across the country, elected officials are enjoying a favorite old past-time: attacking the food stamps program. The U.S. House of Representatives Committee on Agriculture met earlier this month to discuss the possible need for restricting Supplemental Nutrition Assistance Program (SNAP or “food stamps”) purchases of certain foods or beverages. State governments across the country are also now debating what low-income families should and should not be eating. State officials in Tennessee, Maine, and Arkansas – among others – are currently trying to impose restrictions on purchases of sugary food and drinks. The United States Department of Agriculture oversees the food stamp program. During the Obama Administration, the USDA rejected waiver applications from nine states – including Pennsylvania – to impose various new limitations on food stamps purchases. It’s not clear what President Trump’s position on these restrictions will be, but his appointment of Sonny Perdue as Secretary of Agriculture does not bode well. During his time as governor of Georgia, Perdue hired a Department of Human Services commissioner based on her prior “get tough on welfare” record in Illinois. Cash assistance rolls plummeted under Perdue, who also signed off on limiting job training and education programs. Just Harvest is sickened by these attacks against our most vulnerable neighbors. Let us be very clear in our position about food stamps shopping restrictions: people in poverty deserve the same choices we all have in our purchasing decisions, without judgment. Attempts to manipulate the data presented by the USDA are thinly veiled attempts to stigmatize people in poverty as being irresponsible with their diet and health, when in reality all Americans need to take a look in the mirror. We all have some personal responsibility for our health and our diet. 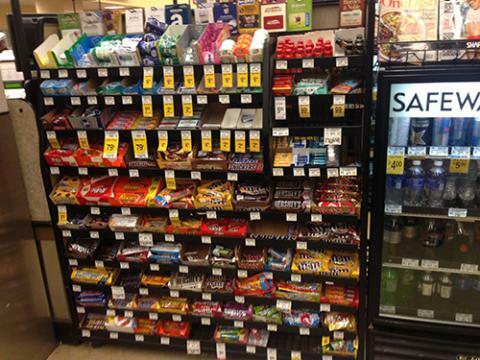 If you’re craving a candy bar, your decision to eat one should not be dictated by Congress. Our responsibility lies in moderation and building healthy habits. Living in poverty means not having the luxury of being attentive to your own nutrition; survival is simply more important. Limiting the purchases of SNAP users is a direct attack on their survival shrouded in false claims that legislators are just doing what is best for our bodies. We would prefer strong guidelines from the FDA that limit the use of added sugar. Better yet, the FDA could take a step further and put a cap on both how much sugar can be in a single serving size and on how many serving sizes can be within 1 unit. (Think about a bottle of soda that is 2 servings or more but is consumed by 1 person). It shouldn’t surprise anyone that Coca-Cola spends $4 billion per year on marketing its products. This targeted consumer marketing drives demand, and forces retailers to meet that demand. Add in business incentives from manufacturers (i.e. coolers are free as long as they are stocked with Coke) and a retailer is trapped between a rock and a hard place when it comes to decisions about how to stock their shelves. Even harder is the choice facing the many low-income people — in Pittsburgh, nearly one in two residents — who have low access to fresh food because they live in food deserts. If retailers do not offer healthy choices, it is unreasonable to expect people to make them. Pushing these policies imply that people have a choice; they don’t. When walking into a food store in a food desert community, if there even is one, you will find soda, chips, candy, and tobacco. 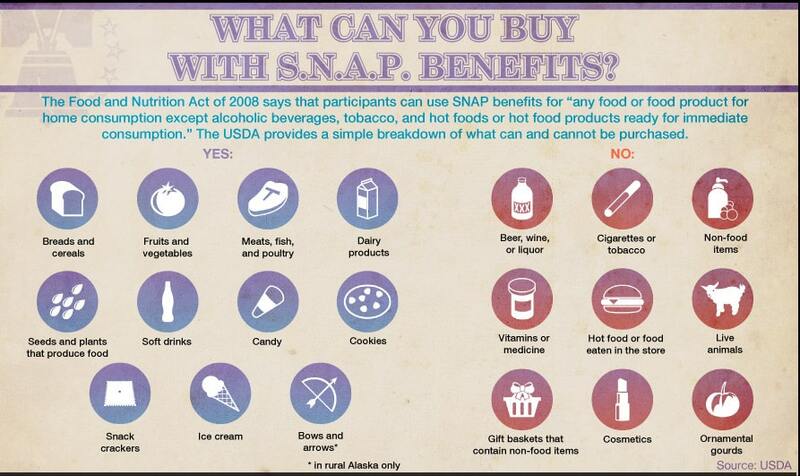 If the government is so concerned about what SNAP recipients eat then maybe they should be concerned about what the stores in their communities sell. It is also important to regulate manufacturers and retailers because doing so helps all shoppers. Why should only those paying with food stamps be limited in the things they can eat, but those with cash, credit, or debit cards should feel free to eat whatever junk they want? Some would answer, “The difference is my tax dollars are helping to pay for food stamps. I don’t want to support people eating junk food.” Let’s set aside that of those who aren’t children, seniors, and pepole with disabilities, most of the rest of people on food stamps are the working poor and also pay taxes. Even so, our tax dollars support all kinds of policies we disagree with. Like corn subsidies. If legislators want people to eat less processed foods made with sugary corn syrup, maybe they should stop paying farmers to grow so much corn. If our legislators truly want to improve public health, limiting food stamp purchases is a pretty inefficient route. How about protecting and improving low-income people’s environment and their access to affordable quality health care and housing? Or raising the minimum wage, fighting discrimination, and boosting food and drug safety regulation? Maybe legislators could work to strengthen Social Security and Medicare, rather than talking about cutting and privatizing these programs? Or extend the nation’s most effective anti-poverty program: the Earned Income Tax Credit. All of these efforts would improve the health of low-income people and help them afford healthy food. Instead, too many people spend time complaining about what’s in poor people’s shopping carts. Which is making it hard for us at Just Harvest to keep track — is it that poor people are wasting their food stamps on junk food, or that they’re getting more steak and lobster then the rest of us? None of this makes sense nor is it about promoting public health. If it was, we would ban junk food for everyone. If this were about the judicious use of people’s tax dollars, the rule would extend restrictions to money that comes from social security checks, unemployment checks, profits made possible with small business administration loans, subsidized grazing on federal land for cattle ranchers, and perhaps even President Trump’s $916 million tax write-off from 1995. So, why are SNAP dollars singled out for this treatment? Because this is not about public health at all. This is about demonizing the habits and choices of underserved, under-resourced, over-worked, and underpaid neighbors in our community in order to justify cutting funding for the government programs that help them. These proposals are not about concern for people’s nutritional well-being. They are a wolf’s attempt to judge, stigmatize, and punish food stamp users hiding in the sheep’s clothing of nutrition. Plain and simple, this is another battle in the War on the Poor. Josh is Just Harvest's Fresh Corners coordinator. You can read more about him here. Absolutely right, it’s about demonizing the poor. There isn’t a month that goes by that some nosy person doesn’t make a comment about my choice of groceries bought with food stamps (usually it is a crack about how “they” can’t afford organic food). If you buy junk, people make nasty comments. If you buy organic, people make nasty comments. Usually I just tell them that I would gladly trade my EBT card for their job, their mortgage, their car payments, and so on. That usually shuts them up. It’s demoralizing for me, though. More than once I come home in tears, which doesn’t help when I am struggling to get my groceries on and off the bus (like most poor folk, I don’t have a car). I think most of us would prefer good jobs to being on any kind of assistance. But who is going to hire a disabled senior, even one who has an advanced degree? If someone doesn’t have a car, how are they going to get to work or even to a job interview? At 61, even with a master’s in psychology, I know I will probably never have a job ever again. That’s incredibly depressing, and people who trash us poor folk just make our tough lives even worse. I wish everyone could read your article. Oh and for background: I am in an inner-city personally. Im no longer at that job and traveling the US… Nor do I have that income anymore. Through no fault of my own by the way… I was too expensive they said and replaced me with a kid just out of college for way less money. And I am struggling too… Not sitting on my @$* struggling… I work that off everyday. Hey! Some people NEED to eat just sometimes! Know how many calories I burn a day? A snickers ain’t gonna kill me every now and then… Even if I wash it down with a soda… Although I typically drink a ton of water… I love a soda every now and then. Live your life. So what you need a little help and receive benefits. We pay for them out of every one of our psychecks anyway. It gets better… Especially when it can’t get worse. 😉 Cheers.